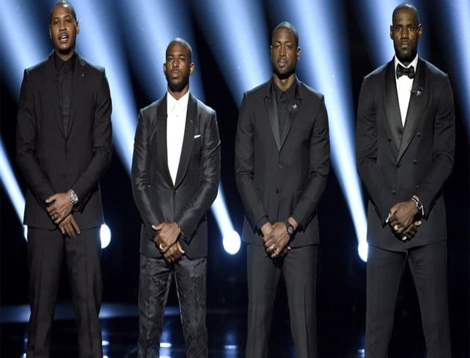 Four NBA stars have issued a plea for an end to the violence in America. LeBron James alongside Dwyane Wade of the Chicago Bulls, Chris Paul of the Los Angeles Clippers and Carmelo Anthony of the New York Knicks took to the stage at the ESPY Awards. James called on athletes in all sports to use their influence make their cities safer with a message of hope at the opening of the annual ESPN awards show. “Tonight we’re honouring Muhammad Ali, the GOAT (greatest of all time),” James said. “To do his legacy any justice, let’s use this moment as a call to action for all professional athletes to educate ourselves, explore these issues, speak up, use our influence and renounce all violence. The NBA players were reacting as many Americans took to the streets in the past several weeks in a series of protests against police brutality and perceived racial bias. Protesters were demanding answers over the killings of two black men by police in two days, Philando Castile in Minnesota and Alton Sterling in Louisiana. “It is time to look in the mirror and ask ourselves ‘what are we doing to create change?” James said at the Microsoft Theater in Los Angeles. The killing of the two black men was followed the shooting of five police officers on Friday when gunman Micah Xavier Johnson opened fire during a protest rally in Dallas, Texas. Wade said the shootings on both sides has to end, decrying not only the killing of black Americans but the retaliatory shootings of the police officers in Dallas.